Paws down, the best grooming around. At Grooming a GoGo, we believe that packages should fit you, not the other way around. So we start with a brief meeting to discuss your wishes and get to know your pet. 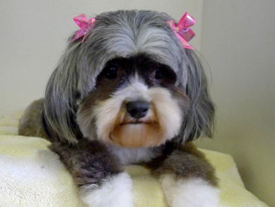 We’ll address any concerns you may have about your pet’s grooming needs. Then select the best way to pamper your pet with caring, thorough, expert grooming. We use the best all natural products to safely and gently groom your pet. Brushing, nail trim/file, ear cleaning, ear plucking (on certain breeds), warm water bath, hand drying, paw trim, gland expression and a bandana/bow. $60 minimum charge, depending on breed, coat condition and temperament. Bath & Tidy services, plus breed haircut. $70 minimum charge, depending on breed, coat condition and temperament. Pricing depends on services, breed, type of coat, coat condition and temperament of your pet. The add-on prices are in addition to your grooming package price. Please give us 24 hours for all cancellations. If 24-hour notice is not given, you will be charged a $50 cancellation fee. Payment can be made by credit card, cash or personal check. Payment is required upon completion of services. Come back for a second mobile grooming experience and you’ll receive a 10% discount. We aim to please. Check our facebook page for specials and updates. Kelly not only gave Ennzo the best haircut he’s ever had, but she was his best buddy by the end of the appointment. Sophie's feet were perfectly trimmed in-between the pads, and nails cut to perfect length. I wish I could have Kelly come every week!